The Common Technical Document is an international standard for the summary documents needed to obtain regulatory approval of medicinal products. These summary documents involve presenting key information drawn from a large body of data, with input from a range of stakeholders within a project team. The challenges involved in preparing a CTD submission are numerous, and for medical writers will vary according to dossier size, team experience, data complexity and time available. By having insights on all these aspects and proactively seeking pragmatic solutions to issues as they arise, medical writers can guide the project team towards the goal of delivering the final set of summary documents within the agreed timelines. The Common Technical Document (CTD) is not a single document as the name implies, but an international standard published by the ICH that specifies the structure, content and format of summary documents used for obtaining regulatory approval of medicinal products. 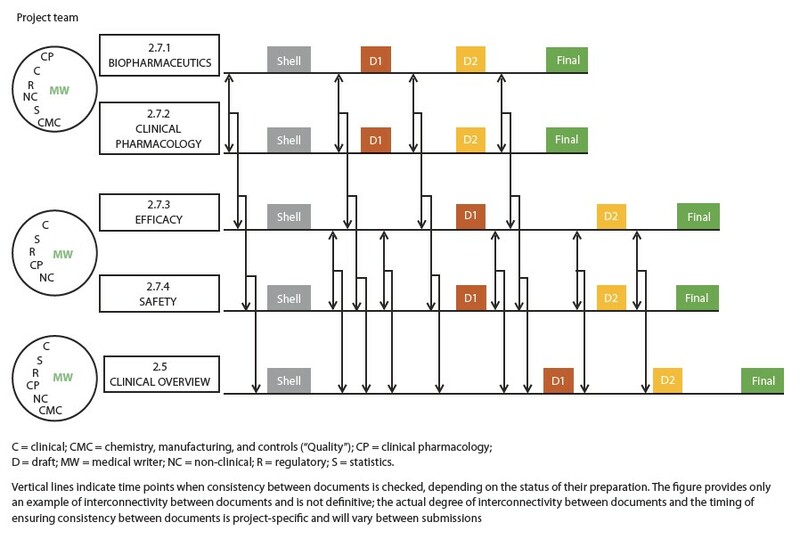 The standard covers the entire spectrum of documentation to be included in a regulatory submission dossier, and provides guidance on how formulation and manufacturing information (‘quality’) as well as the results of non-clinical and clinical research should be organised and presented. The submission dossier is divided into five modules. Conceptually, the overall structure can be regarded as a pyramid, with study reports providing the most detail at the base and an increasing level of summarisation towards the apex (see Figure 1). The highest level of summarisation is the region-specific prescribing information, the ‘label’, included in Module 1. The components included in Modules 1-5 vary according to the type of approval being sought, eg from a large, complex dossier for a new chemical entity to a small, straightforward dossier for a label change. From a medical writing perspective, the authoring involved in preparing a CTD submission is typically for the summary documents included in Module 2. The electronic CTD (eCTD), which is based on the CTD, is the electronic standard published by the ICH for organising and submitting CTD documentation to regulatory authorities. From the medical writing perspective of the summary documents in Module 2, there is no difference between a CTD submission and an eCTD submission. Preparation of a CTD is often regarded as the epitome of regulatory medical writing due to its complexity and the experience needed. The challenges involved are numerous, and for medical writers vary according to dossier size, team experience, data complexity and available time. Typically, the challenges confronting medical writers preparing a CTD are similar irrespective of whether they are summarizing manufacturing information (based on Module 3), non-clinical information (based on Module 4) or clinical information (based on Module 5). In all but the smallest dossiers, these areas will likely be covered by separate medical writers or separate teams of medical writers. The focus of this article is on medical writing needed for preparing and summarizing clinical documentation, which typically constitutes the largest part of a submission dossier. Substantial hands-on experience of writing regulatory documents through to completion is an essential prerequisite for medical writers working on a CTD. To lead the medical writing effort, the writer must have substantial experience of writing CTDs (not just reviewing them), because this is the only way to gain the experience needed to visualise the finalized dossier and manage the multiple work streams required to achieve it. Support writers should, at least, ideally have had the hands-on experience of writing other regulatory documents, such as clinical study reports and investigator brochures. For a larger dossier, the lead writer will typically need to assemble a team of writers with responsibility for writing various components of the clinical documentation. In this constellation, the clinical summaries (Module 2.7), encompassing the four key topics of biopharmaceutics, clinical pharmacology, efficacy and safety, may each require a separate writer. Each of these writers may also contribute to the clinical overview (Module 2.5), or the clinical overview may need a dedicated writer. Figure 1: The CTD pyramid describing the organisation of a regulatory submission dossier. At this stage, it already becomes clear that the lead writer plays a key role in project logistics. The individuals on the writing team may each be interacting with different members of the project team as a whole (eg representing the clinical, clinical pharmacology, statistics, regulatory and non-clinical functions), and close coordination of the writing team is required from the outset to ensure scientific and technical consistency across the dossier. An example of the potential complexity of a CTD – including interconnectivity between documents and the overview that the lead writer needs to maintain throughout the process – is provided in Figure 2. A first step in this coordination is a series of kick-off meetings, which aim to clarify details of the dossier and drive the design of the shells for individual summary documents. Medical writers, whether leading or supporting, must understand the aims of the clinical programme in the context of the data available or expected, and must be in a position to advise the project team on interpretation of the regulatory guidance for writing CTD summaries. When the project team has little or no experience of submission dossiers, the medical writer’s experience can be crucial for advising on how to apply the guidance to achieve not only effective document structure and data presentation, but also an effective process for preparing the documentation. Preparation of a CTD is often regarded as the epitome of regulatory medical writing due to its complexity and the experience needed. The challenges involved are numerous, and for medical writers vary according to dossier size, team experience, data complexity and available time. Figure 2: Conceptual illustration of multiple work streams when preparing clinical summary documents for a CTD submission, including interconnectivity. As early as possible in the project, medical writers must ensure that the project team agrees on key messages and how these can be effectively communicated. The correct time point for this will vary according to availability of data and between summary documents. Even when pivotal data have yet to be provided, key message scenarios can be developed in alignment with the envisaged prescribing information. Key messages are akin to defining the destination of a journey. The challenge for medical writers is often to focus the project team on defining these sufficiently early so that the best route for reaching the destination can be mapped. While this sounds obvious, project teams are often surprisingly hesitant to commit to key messages early in a project, and often prefer to leave their options open for as long possible even when, with hindsight, this is rarely necessary. For medical writers, this form of procrastination can result in multiple changes in direction, with all the ensuing inefficiencies in document preparation – including a substantial drain on the team’s ability to reflect on data and provide effective input. Having aligned the project team on the issues above, the next challenge for medical writers is the practical task of crystallising out essential facts and interpretations from the mass of data included in the dossier. 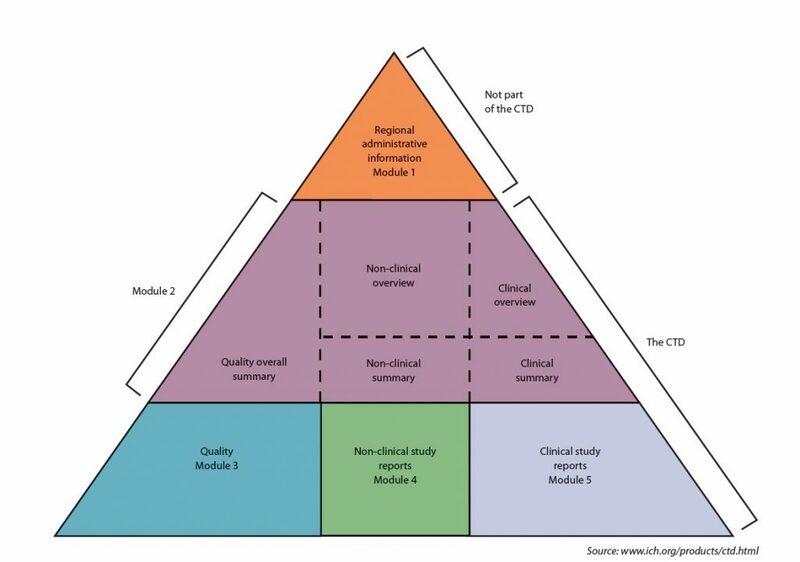 Starting at the base of the CTD pyramid, if the study reports are well written then they should include key messages regarding interpretation of the individual studies concerned. However, it is common for medical writers to have to revisit a poorly written report to establish exactly what the key message of the study is. The clinical summaries (one level up from the study reports) are intended to summarise information from individual studies, as well as provide a perspective across studies. The approach needed varies across the four key topics in Module 2.7. Take, for example, safety information: adverse events from the clinical studies may need to be summarized individually by study, together with an integrated analysis of the adverse events across these studies. The challenge for medical writers is to ensure that at the clinical summary level, only key facts relevant to supporting the prescribing information are included and that essential messages are not muddied by inclusion of unnecessary information. This can be a substantial challenge, because some teams are reluctant to prioritise facts, instead preferring to include as many facts as possible in a clinical summary to ‘be on the safe side’. The clinical overview (Module 2.5) – yet another level removed from the study reports that is intended to discuss strengths and weaknesses across the clinical programme to justify the prescribing information within a space of approximately 30 pages – should provide an even higher level of summarisation than the clinical summaries. Medical writers often need to remind the project team that their audience for the clinical summaries and the clinical overview is primarily made up of regulatory reviewers charged with assessing suitability of the medicinal product for approval. In this context, every piece of information that is proposed to be included in these documents must be examined for its relevance in supporting the prescribing information. Not including a fact in a clinical summary is not synonymous with hiding that fact, because the study reports in Module 5 provide complete disclosure of all the data accrued in the clinical programme. Medical writers often need to remind the project team that their audience for the clinical summaries and the clinical overview is primarily made up of regulatory reviewers charged with assessing suitability of the medicinal product for approval. The assembly of a writing team, coordination of writing activities and maintenance of writing standards provide the lead writer with a substantial logistical challenge. There is also a further challenge involved in planning and maintaining the timelines for reviewing CTD component documents, which must also take account of the interdependencies between these documents shown in Figure 2. The worst scenario is a timeline designed without the input of medical writers, especially the lead medical writer. Unless someone has actually written a CTD, they are ill placed to design the timelines for preparing a CTD, because they may not understand the critical nodes and knockon effects of changes in the timing of individual components. The most effective approach is for the project planner to consult all document stakeholders in the project team – particularly the medical writers – while drawing up the timelines, and these should be regularly revisited and fine-tuned, with buy-in by all stakeholders as needed as the CTD progresses. Even with the best planning, somewhere among all the moving parts there will almost certainly be delay beyond the writer’s control, eg due to delays in planned analyses or the need for additional analyses. Time is always at a premium, and timelines are more likely to be truncated than extended. It is, therefore, crucial to ensure that the original plan is realistic, and buffers and mitigations for rate-limiting steps should be identified that can be used if and when the timelines need to be adjusted. Having a project plan is one thing, but enforcing it can be quite another. For medical writers, the critical logistical aspects that are almost universally challenging while preparing CTDs are the timely provision of source information; an effective process to conduct the review within a single file; buy-in by all stakeholders that the reviews can and will be conducted within the agreed time slots; and a commitment to decide on the resolution of critical review issues as they arise to minimise or eliminate the need to revisit such issues at a later stage. An essential element is effective planning of the reviewing time slots for all reviewers – including reserving time in calendars – so that a realistic amount of time is available for reviewing with a minimum of conflicts with other activities. If a member of the project team needs to review multiple documents within an unrealistic timeframe, the reviews will not receive the attention they deserve; issues will not be addressed appropriately; and unaddressed issues will stack up later in the document preparation process when the least amount of time is available. A further challenge for medical writers is document review by senior management. In part, this is influenced by company culture, which can range between senior management having full faith in the project team and feeling the need to provide only minimal input to preparation of the CTD, to senior management providing extensive input. The quality and relevance of this input can vary considerably, and may or may not be helpful. For medical writers, the situation can become a substantial challenge when senior management input is added at the later stages of document review, especially when earlier decision-making is overturned. Medical writers with a wealth of experience can often sense when such a situation may arise, and will urge the project team to include senior management in early review rounds in an attempt to mitigate the situation. Depending on the complexity of the submission, preparation of the CTD and the ensuing review cycles can be a lengthy process, but at some stage the summary documents must be finalised. In the later stages of preparation, medical writers play a key role in ensuring that all stakeholders are satisfied with the documents, and that these are factually correct and technically coherent. For the lead writer on the submission, the challenge is maintaining contact with project subteams across the four key topics of biopharmaceutics, clinical pharmacology, efficacy and safety, reviewing their documents through all stages of preparation. This ensures consistency of message and presentation across documents. In the final review round, the lead writer must ensure that all the CTD summaries are consistent between the individual clinical summaries (Module 2.7), and between these and the clinical overview (Module 2.5) as well as the proposed prescribing information. Irrespective of whether medical writers are responsible for the entire dossier or one or more component summaries, they are most effective when they operate in a role best summarized as ‘the glue that holds it all together’, ensuring that the various interests of all stakeholders are taken into account in the documents being prepared. Medical writers must ensure that all content issues have been resolved, and that the final document is delivered in a timely fashion. A common challenge for many project teams is their tendency to disband after the CTD dossier has been submitted. This is unfortunate, because often there is a substantial requirement for document authoring and preparation before a regulatory decision is received. Almost all development programmes contain certain weaknesses or other issues of concern for regulators, generating questions during review of the dossier. In Europe, these questions come at predefined time points – 80 days after dossier acceptance for draft questions and after 120 days for final questions – while in the US, questions may come at any time after dossier acceptance. The questions posed by regulatory reviewers vary from straightforward technical queries to requests for new analyses or further interpretation of existing analyses. Questions regarding interpretation of data will usually require medical writers in the project’s rapid response team, with a central role in crafting responses and in coordinating input from the various stakeholders involved. Ideally, the same medical writers and other stakeholders who prepared the CTD should also be available in the post-submission period, so that their legacy knowledge is available when a rapid turnaround is needed for responding to questions. Thought should also be given soon after the dossier has been submitted to proactively assessing weaknesses in the clinical programme, and any potential questions that may arise even before they are raised. Time invested at this juncture can pay dividends when questions are received and responses are required in a short timeframe. The challenge for medical writers is to focus the project team on providing input for addressing questions that have yet to be officially posed. Here, medical writers can facilitate the process by proposing pragmatic means of capturing thoughts on topics, eg via text or bullet points in a spreadsheet, together with other practical information such as the status or location of any additional analyses needed. Medical writers can also be effective in supporting the team in preparing materials (briefing documents and presentation slides) for an oral explanation meeting in Europe or an FDA Advisory Committee meeting in the US – events that can be instrumental for the decision on regulatory approval. Medical writers, with their central role in preparing the summary documents needed for a CTD submission, face numerous challenges depending on dossier size, team experience, data complexity and available time. By having insights on all these aspects and proactively seeking pragmatic solutions to issues as they arise, medical writers can guide the project team towards their goal of delivering the final summary documents within agreed timelines. An overall challenge for medical writers is to remain focused and diplomatic at all times, understanding that they are likely not the only members of the team under intense pressure to complete the CTD on time.